As I've probably mentioned recently we are in the beginning stages of planning a remodel project..like the very beginning. Like the…"Should we or shouldn't we".. kind of stage and so I've been trying desperately hard to weed through some of the accumulated amounts of stuff from several moves and 25 years of marriage just in case we proceed in the "yes, we should" direction. If that's the route we take, we are going to need to have that basement much, much more organized. Here's the issue..I kind of feel like this little boy…I'm not making an ounce of headway. So that's my excuse for not accomplishing more. My "proverbial kittens" keep running away from me. As soon as I put something away, it somehow manages to pop right back up..a sort of a real life "whack-a-mole". I was pretty excited to check this monthly project off my to-do list. Every month as a special perk for my Paper Pumpkin subscribers I create 7-9 additional cards/projects using the given stamp set and the colors contained in the kit. 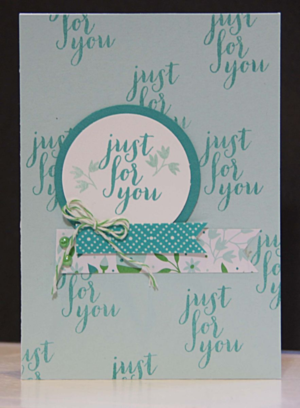 Here's a quick variation from the March kit called, Pocket Full of Cheer. It's a great little set for Graduation, Babys, Birthday and other gift giving occasions. They were meant to include gift cards so I just love this option. Here's the GREAT news for the month of April for Paper Pumpkin! It's a big month for us! It's Paper Pumpkin's third birthday and we just shipped our ONE MILLIONTH kit! To celebrate, the April Paper Pumpkin kit will include a bonus stamp set called All about Everything. Stampin'Up! is keeping the art a surprise, but I'm sure we will love EVERYTHING about it! It's free..what's not to love? This is just Stampin"Up!s little way of saying thank you to their amazing subscribers. Subscribe by April 10 to get in on the fun! So hurry. Head over to www.mypaperpumpkin.com and sign up today. Make sure you use my name, Sarah Schueler as your demonstrator! Now remember, pumpkin kits make great gifts as well. I've sent a three month subscription to my niece for her birthday. I'm sure she will love it! So in the meantime…I'm going to keep trying to corral my kittens, attempt to check a few things off the list and wait not so patiently for my April Paper Pumpkin to arrive. Enjoy…here's a March Paper Pumpkin Variation. I love having a little magic arrive in my mailbox, month after month…and I'm sure you would too! We deserve it. We should be treated like the Princesses we are meant to be!